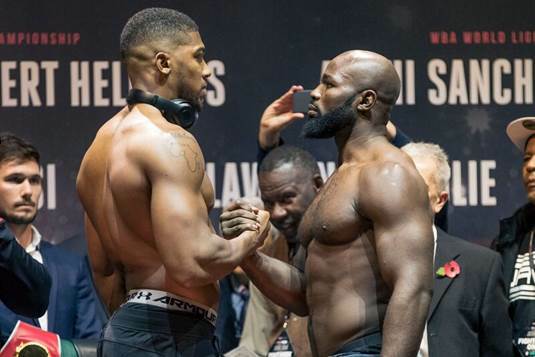 Unified Heavyweight World Champion Anthony Joshua tipped the scales at a career-high 254 pounds and IBF mandatory challenger Carlos Takam measured 235 ½ pounds for their heavyweight showdown tomorrow on SHOWTIME. The SHOWTIME CHAMPIONSHIP BOXING telecast begins live at 5 p.m. ET/2 p.m. PT from sold-out Principality Stadium in Cardiff where an estimated 78,000 fans will converge for the largest indoor event in boxing history. Joshua, who went past the 10th round for the first time with a sensational knockout of Wladimir Klitschko on April 29, promised conditioning wasn’t an issue. The referee for Saturday’s contest is Phil Edwards and the judges scoring ringside are Michael Alexander (England), Pawel Kardyni (Poland) and Ron McNair (New York). If Joshua’s previous 19 bouts are any indication, the judges might not be necessary.